Michael is a 32 year old male who has had long term breathing problems. In addition to this medical condition he had been unhappy with the shape of his nose. The decision to have the cosmetic surgery was prompted by a friend who had just had successful Rhinoplasty and he began to think more about it. Ideally he would like his nose to be finer and less pronounced. Initially he didn’t have a clear picture of what exactly he wanted done. He visited a plastic surgeon to have a preliminary consultation and to see exactly the things that could be done. Because he didn’t know what he wanted done he was looking for the surgeon to tell him what to have done. At the end of this consultation and with a clearer understanding of the possibilities the doctor told him to go home and to give it more thought. 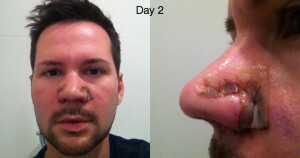 When he went back for his second consultation he was able to give the surgeon a clear picture of how he would like to have his nose shape improved. Michael’s final instructions to his surgeon were both cosmetic and medical. He had picked out 5 things that he would like to have done. These included getting a thinner less broad nose with nostrils that were less flared. He also wanted the surgery to improve his breathing. This would involve repairing his deviated septum and enlarging the nasal passages at the back of his nose. The consultation process was very helpful because at the end of it he thought “Good, I know what he is going to do”. The surgery was day surgery and involved two surgeons. One surgeon undertook the medical procedure before handing it over to the plastic surgeon to do the cosmetic work. 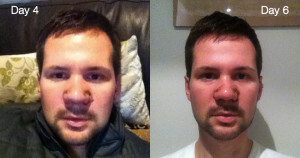 The two procedures took roughly 1.5 hrs. Immediately after surgery he got a very bad nose bleed because of complications related to the internal medical procedure that was carried out. This was the only real problem that arose post-surgery. Now one month on his nose looks better, but he can see that it’s still very swollen, and there’s a lot more that needs to happen as it deflates. The doctor advised that it would take at least a couple of months for the swelling to subside. He wished that he could hide every mirror in the house for at least 2 months! The doctor’s advice was that his nose shape will change slowly as scar tissue heals, but the fine detail will be after 2 years. Michael’s procedure was complicated by the concurrent medical procedure to repair his breathing. In hindsight now he says he probably would not have had the medical work done but definitely the cosmetic procedure. He is very happy with the way his nose is starting to look.